Whew. There was so much love in the room right now between Governor Andrew Cuomo and Mayor Bill de Blasio that their respective romantic partners may get jealous. Okay, okay, we get it: They’re sick of reading stories pitting the two men against one another over the best way for New York to expand prekindergarten and after-school programs. Never mind that De Blasio had just spent the previous two hours in an Albany legislative hearing expounding on how his plan was better than the governor’s. 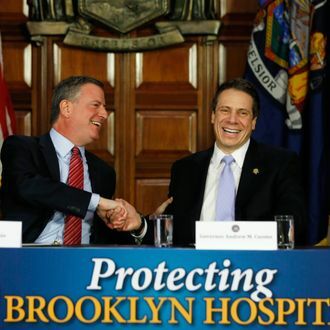 The mayor followed it up with a public sit-down with the governor ostensibly devoted to pleading with the feds to send New York $10 billion to save Brooklyn hospitals. And while there’s an urgent, sincere need for the money, a point on which they are in fact in lockstep agreement, the larger power dynamics were fascinating. Cuomo, by staging the meeting instead of letting the mayor come and go from the state capital on his own, made himself a bigger part of the story. De Blasio, by sitting beside the governor as a near equal, further elevated his stature and underscored the reality that prekindergarten is his signature issue, and that he’s forced Cuomo to deal with it. And they both got to showcase the genuine bonhomie that is now being tested. Finally, when they got done swearing how they would ultimately come together for the good of the citizenry to resolve their well-meaning differences, the governor injected some hard truth. Answering a question about the core issue, Cuomo was beautifully blunt: “It’s about the money,” he said. “It’s about the money.” De Blasio couldn’t resist getting in the last word: “We’re going to keep working together.” Perhaps they can seal the deal on Valentine’s Day.